Icon of Saint Catherine of Alexandria, with scenes from her martyrdom. 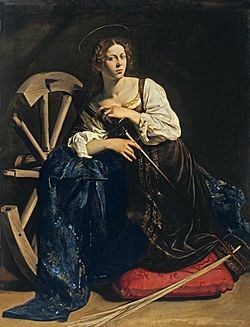 Saint Catherine of Alexandria by Artemisia Gentileschi. Catherine of Alexandria, by Carlo Crivelli. Ring of Saint Catherine, given to pilgrims visiting Mount Sinai. Saint Catherine in a 15th-century fresco on the St. Jacob church in Urtijëi, Italy. Catherine of Alexandria Facts for Kids. Kiddle Encyclopedia.